Everyone here at the library (and beyond!) tries to come up with ways to make the library a better place. Friendlier, more welcoming, more technologically inclined (we really did get that credit card reader that we promised), more educational, more entertaining. That requires lots and lots of input, from lots and lots of people. Then we sit down and read through every single bit of it and see what ideas match other ideas and how often and how we can make those ideas work with other ideas. I tell you; it’s a process. A long and arduous one that eventually yields results. Attached herein you will find those results, typed nice and neat. This, my friends, is what we are doing, what we are trying to do, and what we will try to do in the not-too-distant future. We take a photo to add to our internal account software. No one outside of library staff ever sees the photos. The purpose is simply to provide an extra layer of security for our patrons. FYI: library cards expire every year on your birthday. You must bring the card and photo ID in order to get it renewed. If you’re under 18 you can get a card too. An adult (over 18) must come in with you and show proof of Duncanville residence. This adult is responsible for all fines or other activity on the juvenile’s card. We’ve got options for people who don’t live in Duncanville. Duncanville ISD teachers: bring in your school ID and get a free card. You must renew annually with your school ID. Property owners: bring photo ID and the property tax papers. 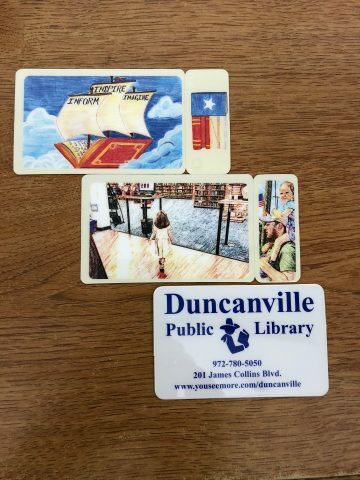 Patrons who do not live in the city of Duncanville may purchase a Non-Resident Card at the cost of $35 per year. Those who only require use of our computers may purchase a Computer Guest Card for $20 per year. Residents with a paper TexShare card issued by their home library may present it, along with current photo ID, to be issued a free TexShare Card with limited borrowing privileges. Patron must bring along a witness if needed. Library staff or other patrons cannot be solicited for transactions. These include marriage certificates, birth or death certificates, etc. Notary may not complete an I-9 form. Services are limited to Acknowledgments only.